In this guest post, Naomi shares everything you need to know when planning your trip to Tel Aviv, the best restaurants and accommodation, things to do, and spending your time there like a local. 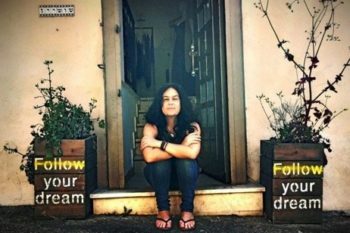 Naomi has lived in Tel Aviv for 20 years and shares her best tips! Everything you need to know when planning your trip to Tel Aviv, the best restaurants and accommodation, things to do, and much more! Also read her blog Telavivnotes for more infos on Tel Aviv. My name is Naomi Bubis and I’ve lived in Tel Aviv for twenty years. I grew up in Frankfurt, studied in Paris, and worked as a journalist for German television. I got to know Israel during my summer vacations and fell in love with Tel Aviv at first sight. The metropolis on the Mediterranean is fun-loving, cosmopolitan, and lively. A bit like New York, but fun-sized and right by the sea. It takes some insider knowledge to really get the most out of a trip to ever-changing Tel Aviv. I write about life in Tel Aviv on my blog Telavivnotes. 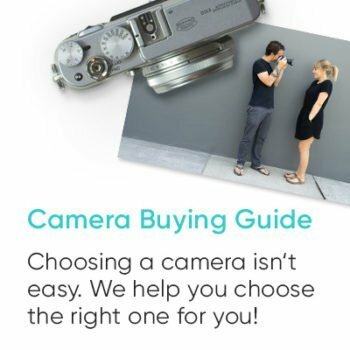 You can also download a free guide there with the best areas for Airbnb accommodation. Tel Avivians live for the moment, day in and day out. 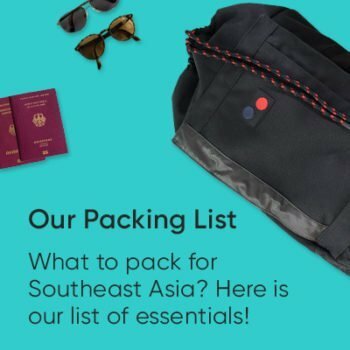 In this guest post, I’ll show you how to spend your time there like a local. Tel Aviv has at least 300 days of sun per year. Tel Aviv is also known as the City That Never Sleeps. The old town of Tel Aviv is called Jaffa. With over 200,000 attendees, Tel Aviv boasts the largest gay pride parade in Asia. 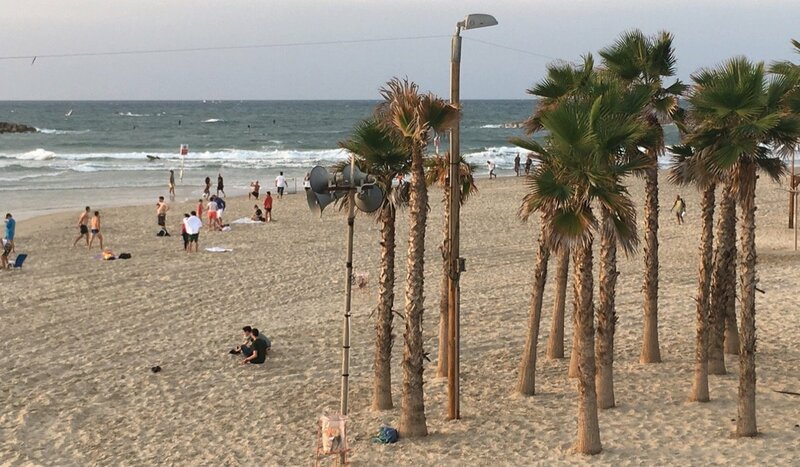 National Geographic lists Tel Aviv as one of the top 10 beach cities in the world. 30,000 dogs live in Tel Aviv, and the city is considered the world’s most dog-friendly metropolis. Tel Aviv is a paradise for vegans. The culinary scene in Tel Aviv is considered one of the most creative in the world. There are over 100 sushi restaurants in Tel Aviv. The Meier-on-Rothschild Tower is the tallest residential building in the city at 155 meters. No question, the off-season. In July and August, Tel Aviv is overrun with tourists. Plus it gets really hot in the summer months. Temperatures rise to 31-34 degrees, and the humidity reaches over 80 percent. That means you’ll be sweating. A lot. If you like hot weather, then you’ll really enjoy yourself here because the heat shows no mercy, not even at night. The positive thing about these months is the general mood in the city. The people live outside. Even at night. Eating a watermelon at a beach café at three o’clock in the morning has a lot of charm. But the best time to travel is in spring or fall. 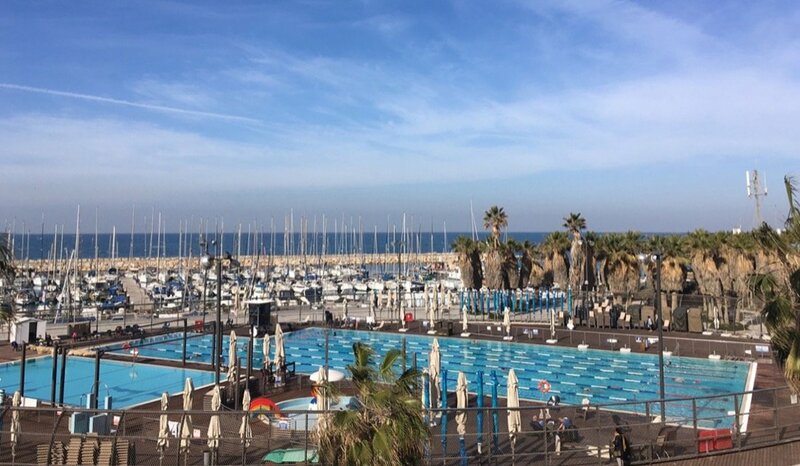 In September, October, and November, when it starts getting cold in Europe, you can still swim in the sea in Tel Aviv at temperatures of around 30 degrees. And unlike in August, you can go for a walk without having to cool off in air-conditioned stores. April, May, and June are also good months for traveling. Tel Aviv literally means “Spring Hill”, and the season sees the city coming out in full bloom. 25 degrees in the shade is just the right temperature to explore the city. And no one will step on your towel at the beach. How much time should you plan for Tel Aviv? You should schedule at least one week. But in order to really immerse yourself in the vibe of Tel Aviv, you’ll need even longer. Fast-forwarding through city life would be a real shame. Tel Aviv is a young city and was founded in 1909. It has almost 450,000 inhabitants, but many Israelis work in the economic and cultural center, so upwards of three million people fill the streets during the day. The best way to get around Tel Aviv is on foot. The distances aren’t that great and there’s plenty to see. All major airlines fly to Ben Gurion International Airport near Tel Aviv. Several Lufthansa and ELAL flights arrive daily from Frankfurt and Munich; and EasyJet and Airberlin fly here from Berlin. The latter two are the cheaper options. It’s a four-hour flight from Central Europe to Tel Aviv. You’d be well-advised to book early as tickets aren’t cheap and flights are often fully booked. If you want to buy a last-minute ticket, you’ll be quoted horrendous fares of 800 euros and upwards. Ideally, you should to compare flights on Skyscanner and book six months in advance. Flights to Israel are subject to special security precautions – not unlike flights to the US, but even stricter. You should make sure to be at the airport three hours before departure. If you’re flying with the Israeli airline ELAL, the security check is even more thorough. Try to remember that you’re being questioned for your own safety. Stay calm. If you have visas from Arab countries in your passport, you may want to think about applying for a second passport from your passport office before your trip. Stamps from Arab countries won’t bar you from entry <em>per se</em>, but the questioning will be a lot more rigorous. Answer the officials’ questions as politely and calmly as possible. Questioning upon departure is even more meticulous. You may be asked where you stayed and whom you met during your time in Israel. It helps to keep a phone number for your hotel or an Israeli friend in your pocket just in case. Ben Gurion Airport is located between Tel Aviv and Jerusalem. You can get from the airport to the city center by taxi in 20 minutes. The taxi rank is on level G of Terminal 3. Prices for long-distance trips are fixed, so you should ask the driver for the current rate. Normally, the fare should come to around 140 shekels, which is about 35 euros. Taxis are much cheaper than in Germany. In Terminal 3, you’ll find ATMs and bureaux de change. Buses are the most common means of transport in Israel. But to get to Tel Aviv by bus, you first have to take the shuttle bus to the Airport City. The shuttle bus stops are located on the second floor, at gates 21 and 23. From the Airport City, take Egged bus number 475 to the central bus station in Tel Aviv. You can buy your ticket directly from the driver. Alternatively, you can also take the train to the city straight from Terminal 3, on level S, for just 16 shekels. In fact, that’s probably the best option. If you’d like your trip to be a bit more comfortable, you can also book a private airport transfer ahead of time. You can find more information here: Private airport transfer Tel Aviv. Important: There’s no public transport on Shabbat (Friday afternoon to Saturday evening). Flip flops, shorts, swimming trunks, bikini, bath towel, sunglasses, sunscreen with a high sun protection factor, headgear, T-shirts, jeans, sweatshirt, sneakers, summer dress. When you go to Tel Aviv, you can pack light. Only during the winter months from December to February do you need to take a rainproof jacket and a thick sweater. 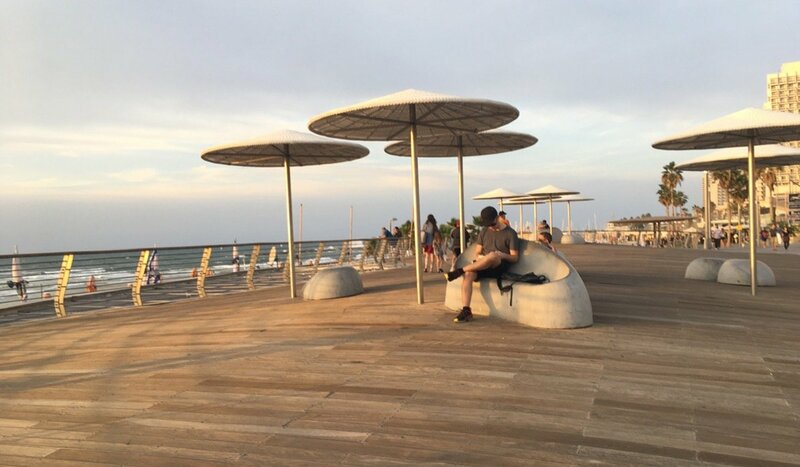 Tel Aviv is a laid-back city. 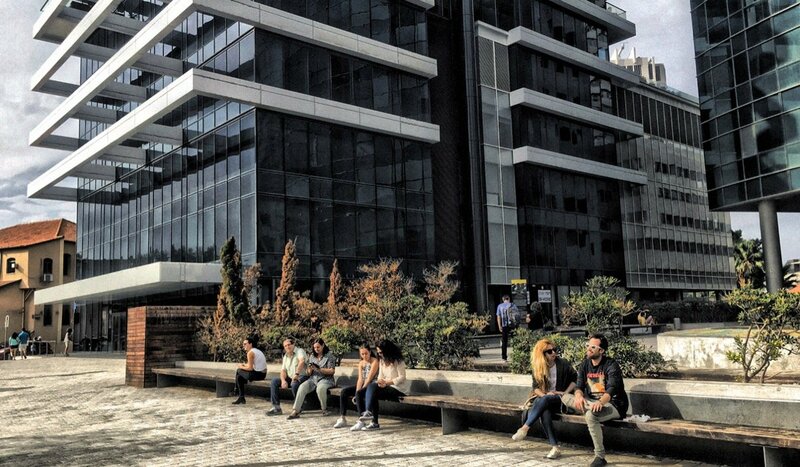 The New York Times crowned TLV the ‘capital of cool’. You can walk around dressed any way you like without people giving you weird looks. It’s totally normal to walk your dog in your pajamas and slippers in the morning or to sit on a park bench with curlers in your hair. Tel Aviv has an urban hippie flair. You’ll hardly see any men in suits or women in pantsuits. Eight months a year, the dress code primarily consists of: flip-flops, sleeveless T-shirts, shorts, airy dresses. In the winter, Tel Avivians exchange their flip-flops for boots and put on layers upon layers of sweaters because 15 degrees are already considered freezing cold. You’ll also need a power adapter for Israel, such as this universal adapter. Tel Aviv is definitely an expensive destination. The cost of living is high. Rents have reached New York or Paris levels. You’ll be shocked by the prices at the supermarket. Sometimes, they’re as much as double that in Germany. 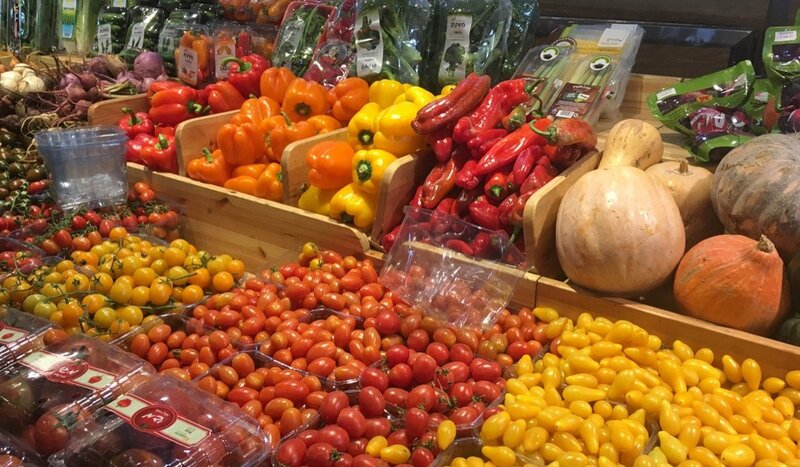 Tip #1: Buy fruits and vegetables in the markets. Tip #2: Tel Aviv has a free WiFi network. This means you can surf the Internet for free on a park bench or at the beach. Tip #3: Get your coffee at Cofix. Everything only costs five shekels here (about 1.20 euros): cakes, cookies, beverages, and coffee. Cofix also operates six supermarkets in Tel Aviv where all products cost five shekels. Tip #4: Eat street food such as falafel, hummus, and sabich. One portion costs around 5 euros. Tip #5: Keep your eyes peeled for business lunch deals and happy hours at restaurants. You can just cycle from A to B and park your bike at any station. Riding into the sunset down the beach promenade to the old town of Jaffa: now that’s something you have to try. Tel Avivians love their e-bikes. The street scene has completely changed over the past few years. Nowadays, pedestrians need to watch out that they don’t get run over by e-bike-riding teenagers. If you’d like to experience Tel Aviv with the wind in your back, then hire a battery-powered bike. An e-bike costs 100 shekels a day. Pole Position is a decent rental service – you can book a guide for a city tour by bike here too. They also provide city maps with bike paths drawn in. 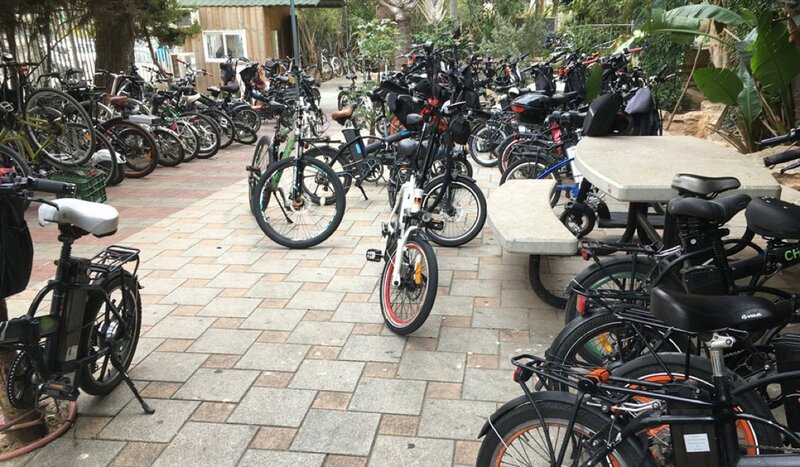 Another popular rental service is O-Fun – e-bikes here cost 120 shekels a day. Tip: Take shared taxis. The yellow and red minibuses stop at the wave of a hand and are a quick and reliable way to get through the city. You mustn’t miss out on a bike ride down the beach promenade. The most popular means of transport in the entire city – e-bikes! Israel is always in the headlines, and perhaps you’re one of those people who are concerned about traveling to Tel Aviv because of the security situation. But since terror attacks have gone global these days, a trip to the Mediterranean metropolis is no more dangerous than a trip to any other major city. You can feel safe in Tel Aviv. Before you enter shopping centers, cinemas, hotels, and clubs, a guard will search your bag. Be nice to him – after all, he’s being paid (poorly) to ensure your safety. Don’t be frightened when you see soldiers with machine guns eating a falafel at lunchtime. The guns aren’t loaded. You can walk through the city without fear. Just never leave your backpack out of sight. Not because of thieves. But because Israelis have a short fuse when it comes to abandoned bags. Suspicious items are blown up by special units. Tel Aviv is a safe place for women traveling alone. The city is alive at all hours. So you don’t have to worry about walking through the city after dark as a woman. Even in Hayarkon Park, the Central Park of Tel Aviv, you’ll see women going for a solo run late at night. Still, use some common sense – don’t go through dark alleyways on your own. 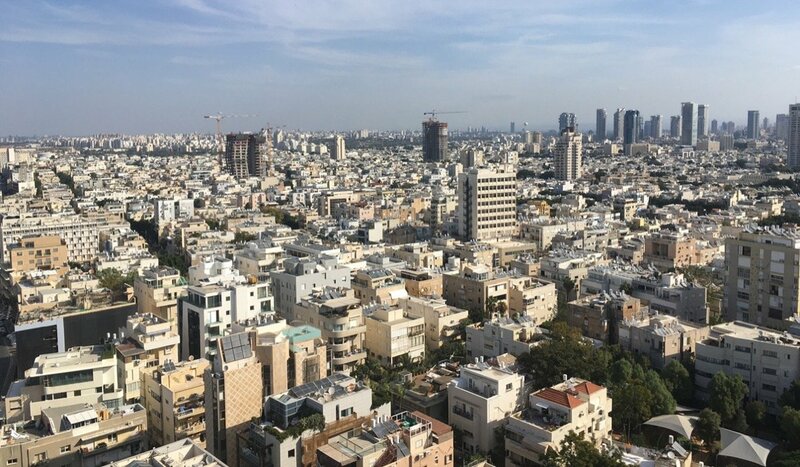 Tel Aviv is also known as the White City because around 4000 houses here were built in the Bauhaus style. UNESCO has registered the White City as a UNESCO World Heritage site. Every Friday, there’s a group tour in English. The meeting point is the Bauhaus Center on centrally located Dizengoff Street where you can buy high-quality books and souvenirs. Tour guide Guy Sharett will take you on a stroll through the trendy southern quarter of Florentin. The tour is in English and costs 100 shekels. Guy knows all the stories behind the countless graffiti that adorn the walls of Florentine. Let him show you the hidden gems of the underground art scene. TLVEG organizes vegan culinary tours through Tel Aviv. The metropolis is a mecca for anyone who’s chosen to forgo animal products. The tour will take you to the vegan hot spots of Tel Aviv. And there are lots of them. You should start the tour on an empty stomach because there’ll be plenty to eat on the way. The tour of the city’s vegan scene is a culinary adventure where you’ll get to meet cool people and try creative food. Highly recommended, and not just for plant-eaters. More information on the TLVEG Tour. I wholeheartedly recommend the alternative city guide DIY Tel Aviv. It’s available as a paperback or an e-book. Abraham Hostel Tel Aviv is the coolest guest house in town. Lots of digital nomads hang out here. 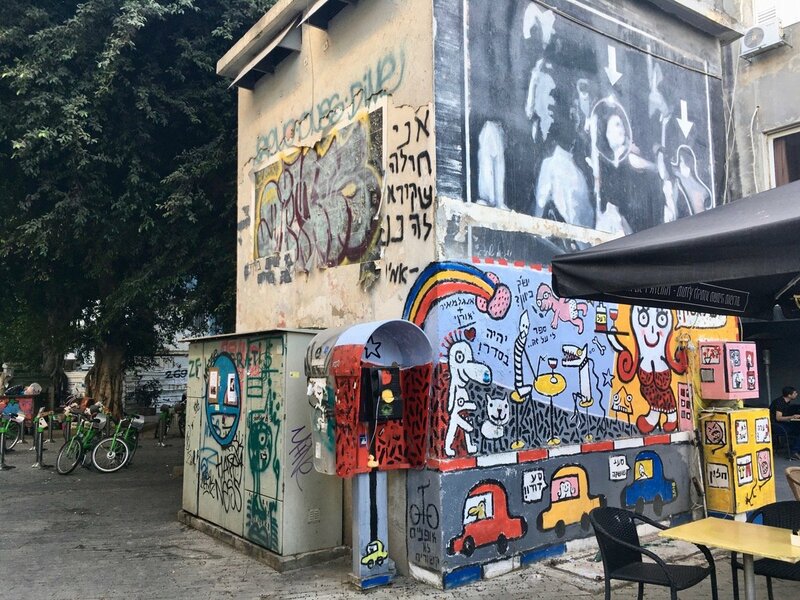 It’s got it’s finger on the pulse of Tel Aviv’s nightlife: just two minutes from Rothschild Boulevard and right next to the legendary Levontin 7, the best live music club in Tel Aviv. The hostel has 350 beds, a great roof terrace, and a bar where locals like to relax with a cool beer. You can book a dorm bed (for around the 100 shekels) or a private room (for 300 shekels). Another option is the more intimate Little Tel Aviv Hostel on Yehudi Halevi Street. Tastefully decorated rooms, a patio for coffee, and a superb location. The hostel is just a stone’s throw from Rothschild Boulevard, the picturesque Neve Tzedek neighborhood, and the renovated ‘Hashmal Garden’ with its offbeat designer stores and cafés. The Galileo is a cool 3-star hotel. 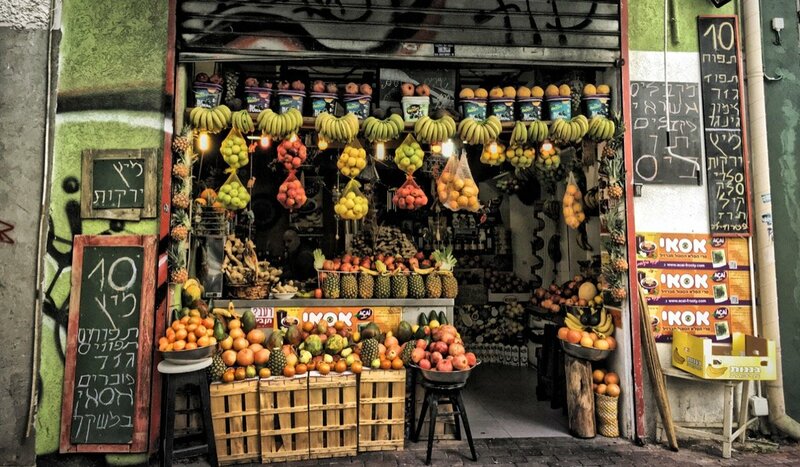 It’s located in the Yemeni neighborhood by Shuk Ha’Carmel, the colorful weekly market. You’d be hard-pressed to get any closer to the pulse of the city. The hotel has a great roof terrace. The funky Yam Hotel is located in the quieter north of Tel Aviv. From there, it’s just five minutes to the sea and the Namal. The renovated warehouses along the wooden deck boast cafés, restaurants, and shops with a view of the sea. The rooms at the Yam (Hebrew for sea) have a surfer flair. They’re small, but cool. The perfect choice for beach lovers. The classic is the elegant Norman Hotel in a side street off Rothschild Boulevard. The Norman resides in two renovated historic buildings from the 1920s. The 50 rooms and exclusive suites each have a unique individual design. The highlight is the infinity pool and the Japanese restaurant on the roof. If you really want to pamper yourself, then this is the place for you. The Shenkin Boutique Hotel is located on Brenner Street, Off-Sheinkin. Sheinkin Street’s glory days as Tel Aviv’s answer to Soho have faded somewhat in recent years, but the area still has its charm. The location is central and the hotel is a perfect retreat from the hectic hustle and bustle on the streets. The 30 rooms have been furnished with great attention to detail, and on the roof terrace, you can relax in a hammock after a massage in the mini-spa. The Brown TLV Urban Hotel is an urban hipster hotel. The 30 stylish rooms are located near the Nahalat Binyamin pedestrian zone. There’s a small arts and craft market here on Tuesdays and Fridays, which is definitely worth checking out. The Brown belongs to Tel Aviv in the same way the sun belongs to the sky. It’s an integral part of the urban culture and the best New Year’s Eve parties take place here. Even if you aren’t staying here, it’s always worth coming for a drink at the Brown Bar. The Market House Tel Aviv Jaffa is located in the old town of Jaffa, right next to the flea market. The hotel runs the Milk Bakery, one of the best bakeries in the city. So it’s no surprise that breakfast here is a veritable feast for palate. In the lobby, the remains of a Byzantine church are preserved under the glass floor. Boutique hotels generally know how to pamper their guests and this one is no exception. 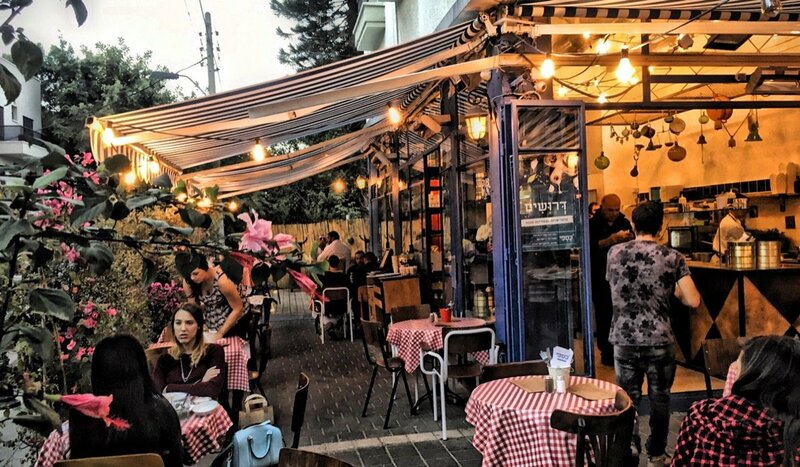 The Lily & Bloom is yet another of Tel Aviv’s hidden gems. The hotel is a declaration of love to the Bauhaus style of the city. It’s centrally located on Lilienblum Street with its cool bars and restaurants. The boutique hotel serves a delicious breakfast, and boasts a terrace and a bar with a happy hour. If you’re looking for a stylish intimate hotel, then this is the place for you. You can enjoy your coffee on Rothschild Boulevard! Or take a break from it all in Hayarkon Park by the river. If you’re a foodie, you’re in for a treat in Tel Aviv. You’d have to be spectacularly clueless to have a bad dining experience here. Creative chefs characterize the restaurant scene. The food in Tel Aviv is among the best in the world. The ethnic influences in this melting pot of over 70 nationalities are particularly pronounced in the culinary world. Tel Aviv has a wealth of sensational restaurants, making it difficult to pick out a handful of favorites. But I’ve given it my best shot. Tip: Make reservations as soon as possible. Star chef Yossi Shitrit runs three restaurants in Tel Aviv, all of which are among the top ten: Mashya, Kitchen Market, and Onza. Mashya was recognized as the best restaurant in town in 2016: modern cuisine with a Moroccan touch, sensory ecstasy for the eyes and the palate. Perfect for a romantic evening. Kitchen Market is on the first floor right above the Farmers’ Market at the Namal Tel Aviv. In the evening, you’ll feel the full vibe of the city, as the locals end their day feasting on brick oven pizzas, tapas, and gourmet fish dishes. Onza boasts the coolest location in the middle of the flea market in Jaffa. The old town with its Jewish-Arabic inhabitants is home to many a trendy restaurant. Onza’s motto is “Food & Vibe”. Two young talented chefs cook Ottoman dishes here with a modern twist. The food is sensual, the music loud, and the audience exuberant. The Thai at Har Sinai is located in a nightlife hot spot. Scattered around the Great Synagogue on Allenby Street are some of the best bars and restaurants of Tel Aviv. The Thai at Har Sinai is located right next to the legendary Port Said and serves authentic Thai dishes every night of the week. The atmosphere is young, with live DJs and lots of alcohol. Santa Katarina right next door is also pretty great. Mediterranean cuisine doesn’t get any better than this. 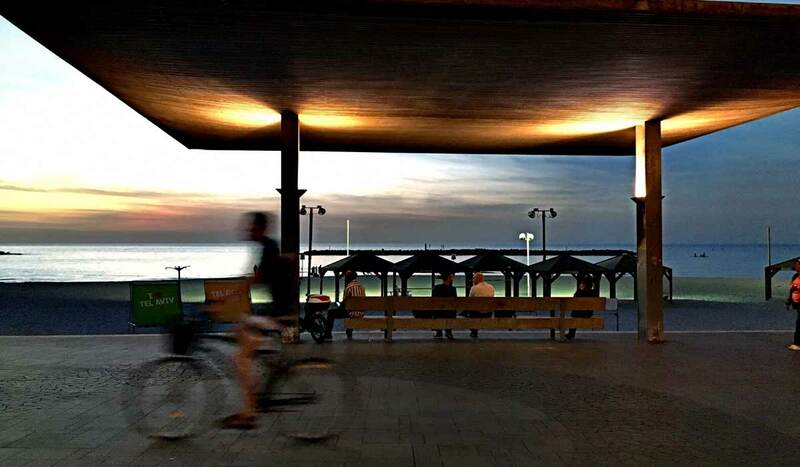 Sitting outside in the summer, surrounded by crowds of people in the bars and restaurants nearby, the magical energy of Tel Aviv is almost palpable. When Taizu opened, it was like a revelation to the spoiled foodies of Tel Aviv. Rarely was a new restaurant received with such unanimous praise. Taizu combines Asian street food from different parts of the continent to create high-end dishes. The ultimate culinary experience. Every Sunday, the Taizu celebrates Indian cuisine. The confectioner Ana Shapiro was recognized as the best in Tel Aviv in 2016. You know what that means: You’d better leave room for dessert! Brasserie: An institution in Tel Aviv, open all hours. Orna & Ella: The sweet potato pancakes are a true classic. Yaffo-Tel Aviv: The flagship of Israeli cuisine by chef Haim Cohen. Romano TLV: Lounge restaurant with a live DJ by crazy cook Eyal Shani. Ramesses: Mediterranean hipster bistro bar in Jaffa with live DJ. LaShuk: Open kitchen with local delicacies. HaBasta: Located in a side street of Shuk Ha’Carmel. Daily changing menu inspired by seasonal produce at the weekly market. Miznon: Gourmet fast food by star cook Eyal Shani. All the dishes are served in pita bread. The all-time classic: pita with roasted cauliflower. The Miznon has branches in Paris and Vienna. Hakosem: The best falafel in Tel Aviv. Right around the corner from the Dizengoff Center, a popular shopping mall. Pasta Basta: The cheap pasta bar has several branches all over town. The pasta is homemade, the service quick, the customers young. Arepa’s: This stall on the Shuk Ha’Carmel has people eagerly waiting in line for Venezuelan arepas, i.e. stuffed corncakes. Sabich Frishman: This unassuming snack bar has the best sabich in Tel Aviv. Sabich is the sister of falafel: pita bread stuffed with hummus, tehina, roasted eggplant, hard-boiled egg, tomato and cucumber salad, and pickles. Tel Aviv is teeming with coffee shops. That’s because Tel Avivians are communicative people, love good coffee, and appreciate their local barista. 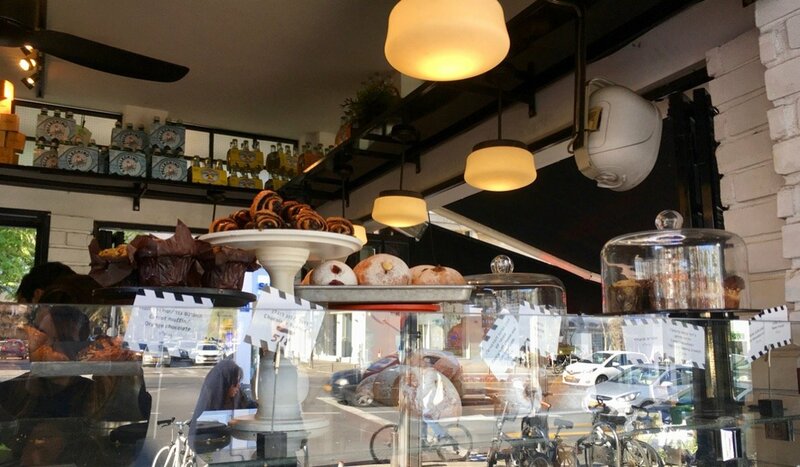 Bucke has two cafés in Tel Aviv: uptown in the north and midtown near the Habima Theater. 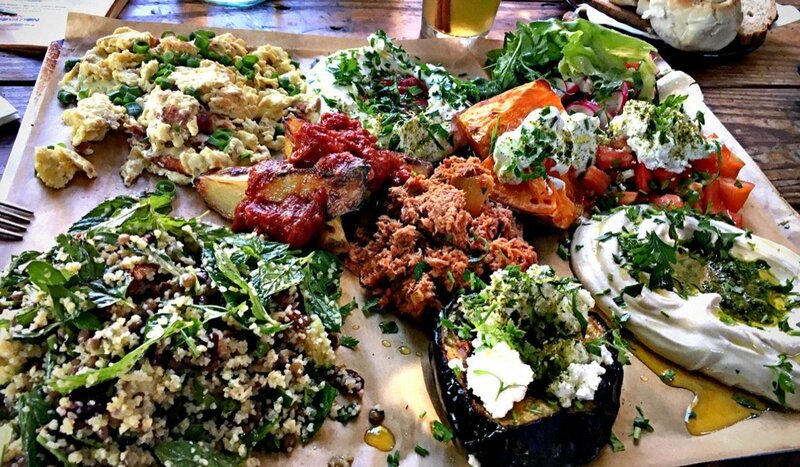 Its breakfast buffets with colorful salads, dips, and vegetable creations are renowned throughout Tel Aviv. Bucke only serves vegetarian dishes. Loveat has the best organic coffee in town. The cafés of the Loveat chain, scattered all over the city, have delicious sandwiches and lunch deals with lots of vegetables, tehina, quinoa, wild rice, tomatoes, and chillies. Nahat Cafe is just the place for coffee lovers. It smells of freshly ground beans and panini. A great place to open up your laptop and take a seat next to the locals. Café Xoho is an international meeting place for students and tourists. You’ll hear a great many languages ​​spoken here. Enjoy gluten-free chocolate cakes, matcha tea, and kale salad. Cafelix is another coffee bean paradise. The coolest branch is located in lively Levinsky Market, nestled in between spice merchants and hipster bars. Fact: Tel Aviv is among the top five vegan destinations in the world. You can find vegetarian options on the menu in almost every café. And no, not just a side salad, I’m talking full-blown dishes. Cappuccino with almond or soy milk is available everywhere. Herzog on lively Ivn Gvirol has a daily changing menu featuring dishes that chef Roey Herzog calls ‘mountains’: rice mountains, quinoa mountains, lettuce mountains, buckwheat mountains, topped with vegetables, tehina, chilli. Roey knows how to conjure up delicious food with vegetables. The best (but rather pricey) place for a quick lunch. Recommended: zoodles with tehina spirulina dressing. At peak times, you’ll have to join a long line if you want to eat at Marketlv on Dizengoff Street. It serves different stews and soups every day: Indian, Mexican, Moroccan, and more. The food is cheap and tastes great. The Dosa Bar is a wonderful place to go for lunch. The South Indian street food is vegan, gluten-free, and, most of all, delicious. Dosas are a kind of pancake, which are varied with spicy fillings. Zakaim, a self-styled vegan boutique, plays in the culinary big leagues. The restaurant is run by the Zakaim siblings. The menu is Persian-Israeli-vegan. This very hip and stylishly furnished restaurant is located right in the middle of the nightlife district surrounding the Great Synagogue on Allenby Street. Essential eating: the potato wedges. Gordon Beach has everything a beach-lover’s heart desires. A laid-back beach café called LalaLand, volleyball nets, fitness equipment, and lots of sun worshipers. Right next door is the Olympic-grade Gordon Pool and the Topsea Surfing Center. Mezizim Beach is located at the northern tip of the beach promenade. A bay bordered by the religious beach (yes, that exists too) and the harbor (Namal). The 9Beach lounge café is located on Mezizim Beach. It’s especially lively in the evenings. And if live football matches are being broadcast live on the big screen anywhere in town, it’s sure to be here. A nice hangout for a beer with your feet in the sand. Hilton Beach is located in a bay right next to the dog beach and the gay beach. 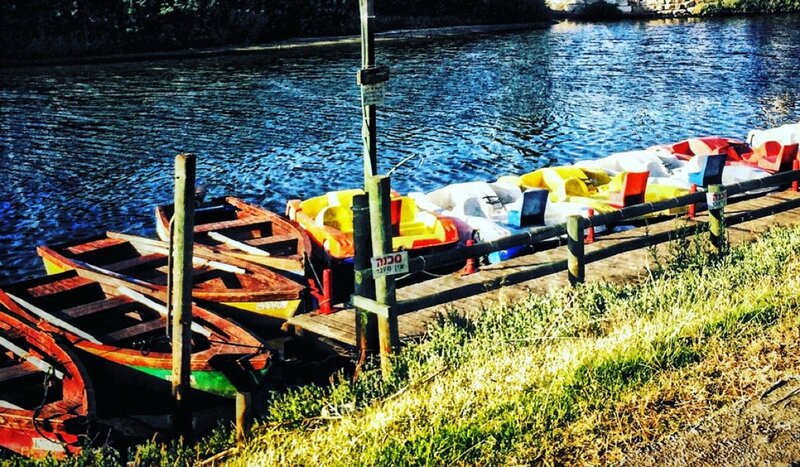 This is the place to be for water sports enthusiasts. 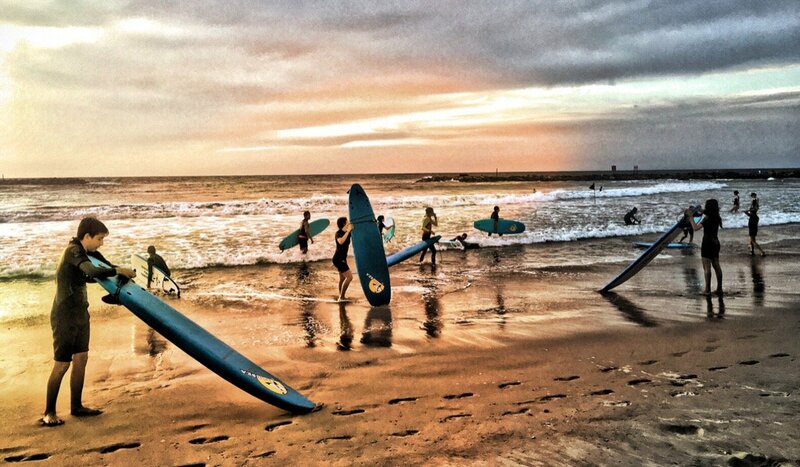 You can hire SUP boards, kayaks, or surfboards at the Sea Center Club. Lots of kids and teenagers come here every Saturday morning to learn how to surf. Banana Beach is located closer to the old town of Jaffa and stands out with its characteristic yellow beach chairs. A beach without an attitude, laid-back, fewer tourists. It also has a surfing school. Tip: On Friday afternoons, Banana Beach morphs into Drum Beach. Standing on the cliffs, the drummers get out their bongos and congas to welcome Shabbat with a drum session. Do you have some great tips for a city trip to Tel Aviv? Have you ever been to Tel Aviv want to share a tip of your own? Then leave us a comment and tell us all about it.